As a service to our customers, we repair and restore damaged and/or antique stained glass art works. 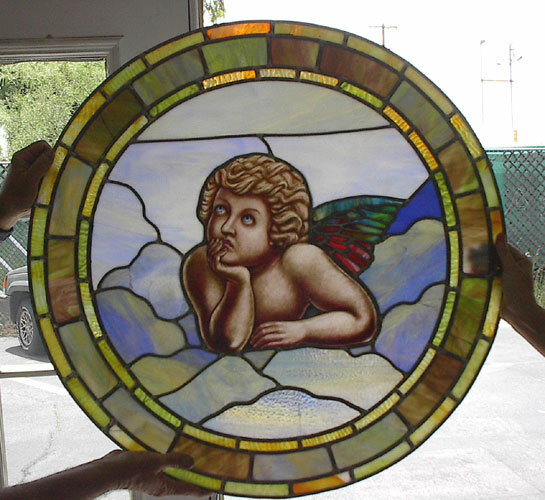 Often a treasured stained glass piece, marred by glass breaks, can be restored to its original splendor by our skilled artisans. We approach each restoration with great care and regard for your prized possession. We recommend a restoration whenever the piece of glass art has significant sentimental value in addition to the monetary investment. Otherwise, it is sometimes more economical to replace the art with a new piece. Let us consult with you on the nature of the repair and help you evaluate whether or not you want to invest in its restoration. 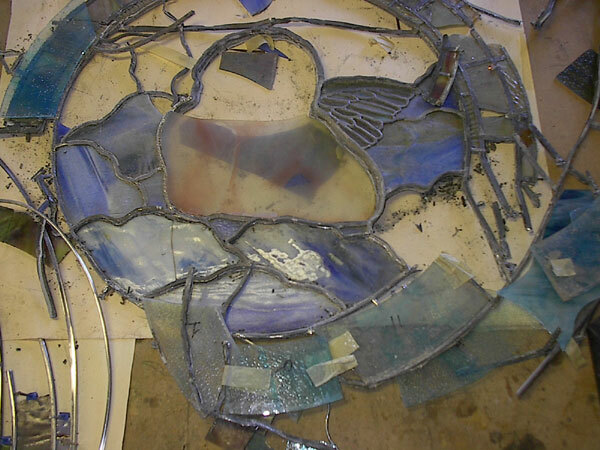 Call us to discuss the nature of the repair or send an e-mail to stainedglass@ochoasg.com attaching a digital photo of the damage to your glass art piece so that we can better estimate the costs. This panel was commissioned as part of a residential rehab project for a 100-year-old home located in an historic part of Tucson. Ochoa Stained Glass Artisan Kristi artisans recreated a piece that matched existing panels adorning the entryway into this grand old home. A client brought us this treasured family memento, believed to have been brought from Europe by relatives at the turn of the last century. 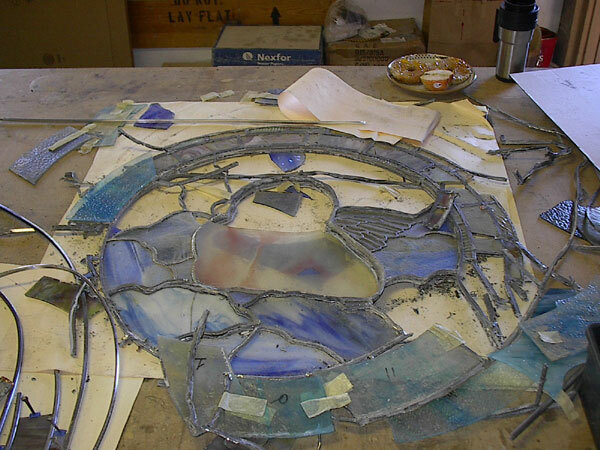 The piece, which had been hidden under a relative's bed for decades, arrived in our studio in dozens of broken pieces, missing fragments of its original glass. We were asked to restore the piece to its original state. 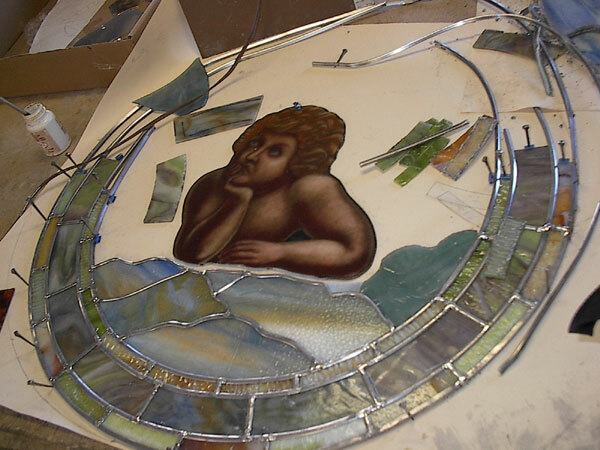 We advised the client that while we could not ensure that we could replace the broken pieces with exact matches of the original glass, nor could we exactly replicate the now broken hand-painted angel face and torso, we could likely fabricate an excellent reproduction, utilizing as much of the original material as possible. After months of searching for the appropriate materials and many more months searching for a glass painter capable of rendering the angel, our client was quite pleased with the result you see here. 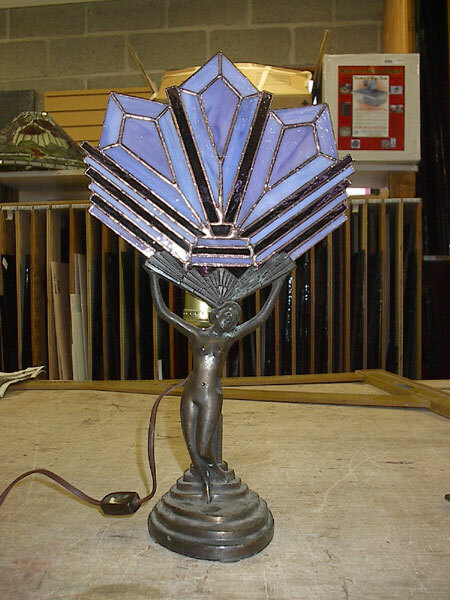 A client brought us this Art Deco Lamp Base purchased at a Garage Sale and asked us to create a lampshade for it to restore it to its original purpose. 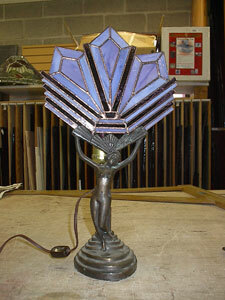 Ochoa Stained Glass Artists created this art glass shade in splendid purple opalescent glass.